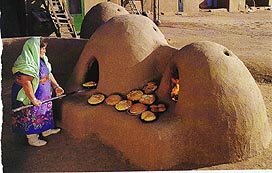 The previous edition didnâ€™t specify an ideal height, and in fact, a high domed oven will work â€” the traditional southwestern horno is typically quite high. In general, however, for bread ovens you donâ€™t want to increase oven volume any more than you have to, as it reduces the concentration of steam â€” and steam is what causes the formation of an ideal crust. In addition, your door would have to get higher and higher in order to maintain the 63% ratio. If you make a really large oven, it gets much trickier maintaining the right curvature of the dome to keep it from falling in (â€œlargeâ€ might be 10 feet wide or more…). But otherwise, I use 16â€ as a standard height for 22â€, 27â€, 36â€, and larger ovens. The largest Iâ€™ve built was 4 feet across, with a 16â€ dome. At that size, I was very careful to make sure that the shape of the dome was truly catenary. In fact, I made a template by hanging a loop of heavy cord so that the ends were 48â€ apart, and the center hung down 16â€. I traced the line, cut it out, and used the template to shape the sand form so that I would be sure of the strength of the dome. The little pic is a postcard of a typical Southwestern horno â€” clearly more than 16â€ high inside the dome. Could you advise a “next step” for me? I applied the first layer yesterday to a 23″ oven and got the mix too wet as it started to slump and crack. So I stopped and waited several hours to “whack” the 1 to 3 thermal mix. Cracks keep appearing even a day later if I try to work it. Should I just let it dry and try to use it or pull it apart and start over? I realize cracks are normal when heat is applied but this seems too early and abnormal.